While we were passing through the hills north of Chiang Rai on our boat ride south from Tha Ton we enjoyed the scenery so much that we started looking for a quiet place to stay for a while before we cross the border into Laos. We found a small place in the hills that looked just the job. We couldn’t find out much about it on the Internet but the few reviews we found were all very positive. I phoned and left a message and it wasn’t long before Nok phoned me back and we were booked in. Nok told us where and when to meet her at the ‘old bus station’. So here we are, mango smoothy in hand, waiting for Nok at 4pm at Bay No. 1 at the bus station. She arrives just after four but we have to wait a while for everyone else to arrive. There are seven of us plus Nok to fit into and onto a dual cab Ute. Three of us try and fit into the back with all the luggage but it is quickly apparent that this won’t work, especially as we expect some of the roads we will be travelling on to be fairly rough. After we voice our concerns Nok trots off and organises a songthaew for us and we get underway. After a while we are driving alongside the Kok River and we start recognising places that we passed in the boat a few days ago. Travelling with us in the songthaew is Michael from Toronto, Canada. After a few stops for Nok to buy some supplies we cross the Kok River and drive past the national park headquarters and the hot springs which we visited on our way down the river. Then we start heading up into the hills which get steeper and steeper. The songthaew struggles to reach a small village where the driver announces that he can’t go any further and we have to walk the last 500 metres. We climb out and quickly see why. The last section up to the Bamboo Nest requires low range in a four wheel drive and it sure has us puffing! The country is fantastic and we stop to enjoy the view and catch our breath at the same time. Our bags travel in style in the back of the Ute. We are quickly checked in and briefed on the honour system for drinks and snacks and the serving hours for breakfast and dinner. We take a short stroll down to our bamboo chalet and check it out. Wonderful! A verandah with a bench and a hammock and we can lie on the bed and catch part of the view across to the mountain rice paddies and the green hills beyond. Almost all of the chalet is constructed out of bamboo including the hammock. The floor of the bathroom is concrete and the roof is thatched with palm tree leaves, but that’s about it. A mosquito net hangs over the huge bed and there is a low bench where we place our backpacks. Two bamboo-shuttered windows frame views of the hills and the banana plants. Otherwise the room is free of clutter. At dinner we meet Michael’s wife Tracey as well as Margrit from Holland, Sue from England, and Luc from Belgium. We are all of a similar age and it is fun catching up on everyones travel stories. Luc has been traveling extensively for several decades and has visited many countries in every continent. Sue and Margrit both lived in Kenya for a while and that’s where they first met. We enjoy chatting about the places we all know there. We also enjoy the small fireworks display from the village below where they are celebrating Chinese New Year. The next day we decide to relax and catch up on our reading plus some writing for the blog. We have brought our coffee plunger and a supply of ground coffee and there is plenty of hot water available so we are set. Luc visits the village and the rest of the mob walk up to the waterfall. It is so peaceful sitting on the verandah and we manage to get quite a bit done. After a while Luc gets back from the village where he has been plied with Beer Lao and offered two women as prospective wives. He soon trots off to his chalet to sleep it off. We enjoy a light lunch and the others get back a little later. During the afternoon we have a brief nap down in our chalet. We leave the doors and windows open to let the breeze waft through. In the early evening we stroll back up to the dining area. After the hustle and bustle of Chiang Rai the contrast of this sleepy hill village with its far flung vistas is a wonderful change of pace. We stand on the patio which looks out over the chalets to the rice paddies in the valley and the hills beyond and breath deeply. The gardens are rich with tropical flowers, banana plants and there is a fireplace on a bamboo platform off to one side. That evening another couple, Bill and Paula, arrive after traveling cross country from Chiang Mai. They are from England and Paula is another amateur photographer so we have a couple of sessions chatting about photography. The days begin to blur into each other. We spend time reading and writing with afternoon naps when we feel like it. I am up early in the morning taking photos of the mist-filled valleys. We get some exercise walking back down to the village in the morning and in the evening to take photographs. We are greeted as we pass through the village and the kids often stop to look at my beard. The odd firecracker goes off but otherwise it is pretty quiet. We are having such a relaxed time we decide to stay a fourth night and our decision comes with an added bonus. In the evening we are treated to a demonstration of how to cook sticky rice in bamboo. Lengths of green bamboo are cut just below one joint and then a couple of feet above to create a long thin receptacle into which water and rice are placed. The open end is sealed with green leaves and then several such bamboo sticks are stood in the burning fire. The bamboo doesn’t burn because it is so green but the rice inside cooks pretty quickly. Once the rice is cooked the tough outer layer of the bamboo sticks is removed with a sharp knife so that the remaining bamboo can be easily split and peeled back to reveal the sticky rice. It tastes great and there is plenty of other food to go with it. We could so easily stay a little longer but we both know that we have some other great places to visit in Laos which is where we are headed next. From Chiang Mai we headed for the hills on a big orange bus. There were a few tourists on board but it was mainly used by locals travelling to the large town of Fang while a few up-country locals and one other westerner were travelling like us to its final destination of Tha Ton. Seats which we thought the right size for two were actually meant for three but we were lucky, or looked too big, and had one to ourselves. Those trying to fit three to a seat often ended up sitting on the edge of a seat or standing in the narrow walkway. Apart from that it was fine with open windows and fans to keep us cool and rural scenery to watch which kept us occupied through the four hour trip. Tha Ton is a small country town near the border of Thailand and Burma (Myanmar) and is a huge change of pace from Chiang Mai. It has one main road and straddles the Kok River. We stayed in a comfortable guest house beside the river for a couple nights and soon had our favourite places to visit for our meals and for coffee, revisiting a few of them several times. We loved the atmosphere of the town and the friendliness of the local people. It was a peaceful stay except for the evening Karaoke across the river from our guest house. Paul enjoyed the early morning mist for some atmospheric photography. Worth a visit is Wat Tha Ton, a temple which stretches up the hill beside the town. It is set over ten levels and we huffed and puffed our way right up to the top. We had plenty of reasons to stop along the way to look at amazing buildings and the statues at various levels as well as the fabulous views to the valleys and river below. We could even see the Thai army emplacement on distant hill tops which looked out over the border with Myanmar. The many coloured temple at the top contained an eclectic collection of statues. Gun emplacements overlooking the border with Burma. From Tha Ton we headed further into the hills and into the area previously known as the infamous Golden Triangle, the area near the borders of Thailand, Burma and Laos which used to be the major opium trafficking route but is now a great area for tea and coffee. Chiang Mai, the capital of northern Thailand, is a fascinating city with lots to see and experience. With only three days in the city we barely scratched the surface but we arrived in time to catch the annual flower festival, visited some of the seemingly unending temples in the city, explored up and down busy streets and quiet laneways in the old town, wandered through a bustling night market and also much quieter local fresh food markets, took an excellent cooking class and ate lots and lots of delicious food. Hopefully the many kilometres we walked balanced out the calories we ate. 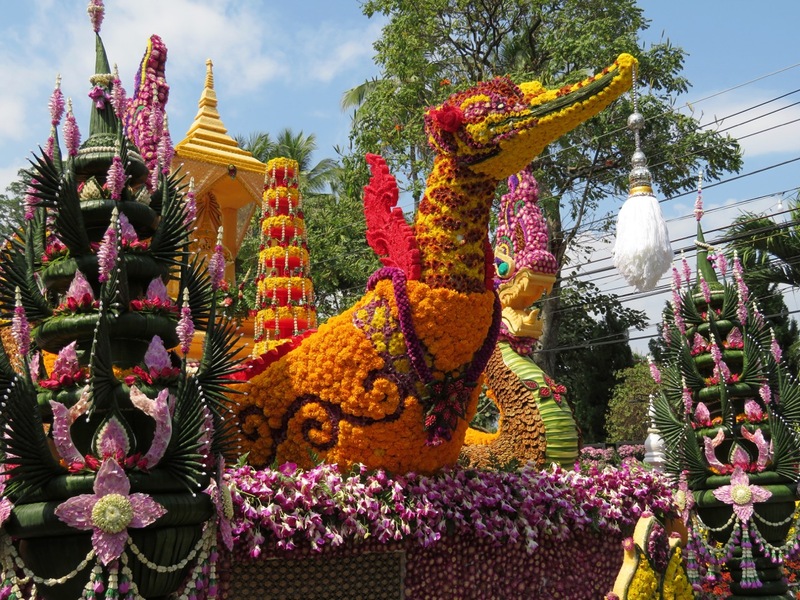 We missed the grand parade of flowers but the displays in the gardens were fantastic and although the flowers on the floats lined up nearby were starting to wilt they were still very impressive. The main streets in the old town are busy and have lots of cars to dodge but the lane ways are delightful to walk along and the motor bike riders are not too numerous to become a problem. The red songthaews ferry people around the city for 30 baht ($1.20) provided you are heading in the same direction they are. There are new hotels going up in any available space and quite a lot of the temples are being renovated using the typical asian style of scaffolding. We did a cooking class with the delightful Yui, a fount of information and practical advice and the dishes we prepared were delicious. After a visit to the market with Yui we left with a cook book so hopefully we can reproduce the tastes. 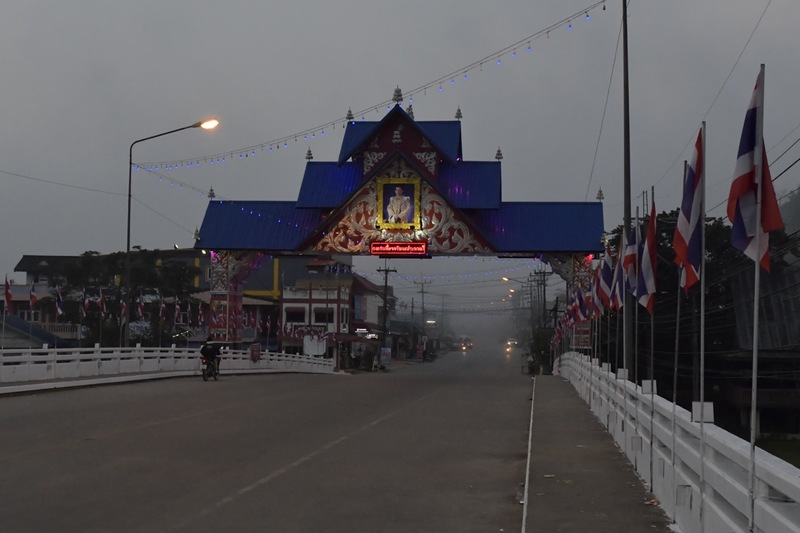 Chiang Mai is particularly noted for its dish of Khao Soi and one of the places which had the best review for the dish was a tiny open area on the northern edge of the old town. The reviews were right, it was excellent and it is no wonder all the tables were filled and people were lining up. We couldn’t possibly count the temples in the old city and didn’t get to see any of the interesting sounding temples in the surrounding areas. The old temples which are often at the side of the new bright and fancy temples were fascinating. To properly see most of the temples and to avoid overload we would need to stay weeks and visit just one or two a day. There are night markets every night but Saturday and Sunday have their own special night markets and we arrived in time for the Sunday session. The market covered at least two kilometres in the old town and all of it was packed with visitors, both local and international. Lots of craft work was offered and some delicious food. Some of the stalls and eating areas were even in temple grounds, a good way to see the temples lit up at night. The fresh food markets were more our speed, we always try to visit them even if we can’t buy the produce. We even caught a performance in one morning market, an elderly lady singing with her husband accompanying her to the delight of the stall holders nearby. Chiang Mai was a great introduction to northern Thailand but now we are headed for smaller places so we can get away from the crowds, see more of the country and visit some of the hill tribes.